AP Police Constable Vacancy 2016: Recently Andhra Pradesh has issued notification for 4548 constable post. It is also known as SLPRB. After a long time they have announced various post of Constable, Warder and Correctional Service Department. All application will be available online and offline mode. So interested and eligible candidate should follow all process. Online application will start from 3rd Aug, 2016 and it will over on 14th Sept, 2016. So date is very short so without fail just completed all process. We have provided all vital details about recruitment which will give you more idea about it or just log on to site recruitment.appolice.gov.in which provide all detail. Applicant who are eligible for this post need to submit their education details, Qualification detail, Basic information, Photo and Signature list. As per Notification RC NO 202/R&T/Rect.2/2016, Examination will be held on 16th Oct, 2016 and time will be around 10:00 AM to 01:00 PM. Below are some of the job highlights just go through it. We have try to find out examination and Syllabus details for AP Police Constable. We are in touch with various coaching class and other institute for the exam syllabus, PDF Files, Last year paper, Previous year paper etc. You can also visit employment news of this week for more information. Read below details carefully. AP Police Constable Admit Card 2016: Soon Admit card will be issued by higher authority just visit official site prior to 15 days of examination they will issue all details about it. Age Limit: Candidate who have age between 18 years to 30 years on 01st July, 2016 are eligible for apply online. Age will be consider on 01st July, 2016. Minimum Education Qualification: Applicant who have passed their Intermediate examination from recognized Board or University are eligible for this post. Payment of Fee: It can be made via AP Online or TS Online Centers or Mee Seva or E-Seva. Candidate will be selected on basis of Preliminary written test, Intimation letter, Physical Measurements Test, Physical Efficiency Test, Written test and final selection process. 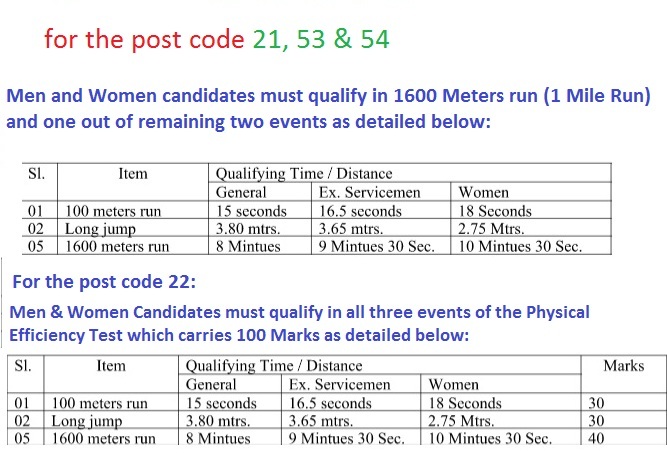 Below are Some of the physical criteria for male and female candidate. Go and Open official site recruitment.appolice.gov.in. Just read and Enter all required details in empty fields. In case of any query about AP Police Constable Recruitment 2016 for constable just write a comment over here we will try to reply you as early as possible. Keep visiting this portal in order to get update about examination, Admit card, Syllabus, Last year paper etc. The AP Police Department encourages the citizens to help the police department in eliminating the crime from the state and for this, they recruit people from the public itself, which gives individuals a chance to serve the society and feel a sense of Pride and Honor.